Hotel Jen Tanglin, one of the most recognizable global chain hotels that underwent a major revamp and rebranding of their long established Traders Hotel back in 2014. Located just a few bus stops away from Orchard MRT station, Hotel Jen Tanglin is one of the rare hotels that bustles with so much energy and personality right from the very start. Most of us are probably somewhat aware that they had undergone a total revamp, but why the sudden change? Catering to the changing needs of today’s millennial travellers aka ‘New Jen-eration’, Hotel Jen seeks to evolve and progress on similar grounds. Emphasis on the Jen values of fun, friendly and fuss-free are now encapsulated in all aspects of the brand without compromising quality. I remembered back in 2014 when I stayed in Traders Hotel for a business trip in Malaysia, staffs were seemingly differently dressed, formal and intense with blazers and such. Gone are those days, now staffs are casually dressed in brightly coloured attires giving that refreshing ‘Jen-feeling’. 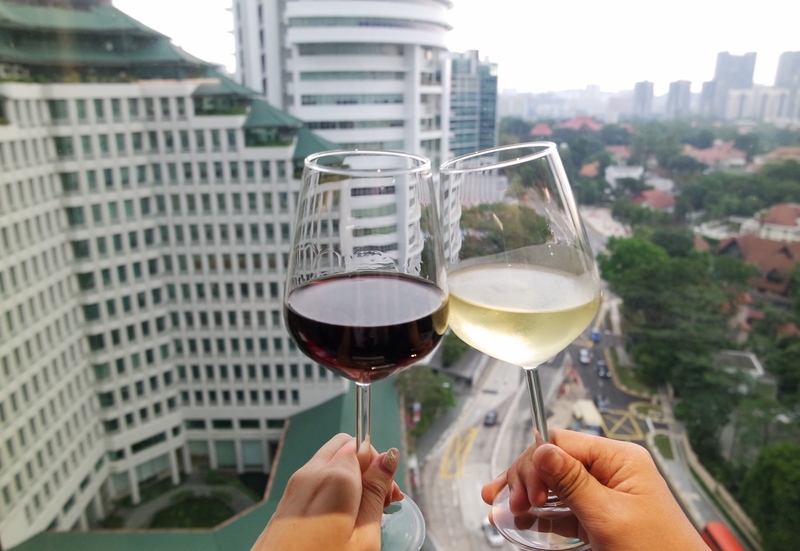 We had the opportunity to stay at Hotel Jen Tanglin over the weekend in mid-April, and were already anticipating with excitement to experience the newly revamped hotel. Front office staff was quick and friendly with their introduction, and were knowledgeable in recommending an itinerary of activities to do for the day. During our stay, we checked into the Club Room, which is exclusively accessible on the upper floors of the hotel – level 17 and 18. The 26sqm room was a spacious sight to marvel in, with the king-sized bed taking centre stage. The interior is visually stylish, clad in brick white walls and soft-toned wood finishes. We could see how the rooms are designed with that added new-jen travellers in mind, with the high-speed WiFi, plenty of USB ports and sockets available for convenient charging of our devices. Over at the corner of the Club Room is a relaxing bay area, with a three-toned coloured sofa of orange, brown and grey, with decorative word throw pillows. A very popular find nowadays, Hotel Jen instills these quite effortlessly sporting favourite and trendy quotes like ‘LOVE, LIVE, LAUGH’ or ‘Keep Calm and …’ branded across the property. We spent quite a lot of time on this loungey-sofa as we couldn’t take our eyes of the wonderful panoramic view of the city skyline. Quite peaceful I must say! Fruits and water to welcome us! The set up of the work desk area was also pretty straightforward to meet the needs of a typical traveller. If you are feeling hungry, there is also a 24-hour in-room Order-In Menu which you will find on the work desk. The bathroom area is configured fairly simply with all the basic bath necessities you can expect to find. Booking a Club Room also entitles you to all the features of a deluxe room, with additional benefits in their newly refurbished Club Lounge. This comes inclusive of daily breakfast from 6:30am till 11:00am, mid-afternoon culinary treats from 2:00pm till 4:00pm, and happy hour in the evenings from 5:00pm till 7:30pm. There’s always something for each guest to look forward to at the Club Lounge with seemingly free flow of cookies, nuts, coffee/tea for mid-afternoon, and during cocktail hour with free flow wine/beer, cocktail cheeses and small canapés. One of the most cosy places to lounge at, we saw many guests coming here for a mini chill away. Hotel Jen’s facilities features the typical range, including a main communal swimming pool, gym, and a spa centre. Hotel guests can also further pamper themselves by accessing the whirlpools and sauna facilities which are separated for males and females. With a name inspired by the Singapore international dialling code, the new-look all day dining restaurant will open to diners for breakfast, lunch and dinner. Authentic South-East Asian cuisine in abundant portions will be showcased in the vibrant restaurant with a modern market look and feel. For dinner, we managed to visit J65 for their delectable multicultural cuisine, featuring Peranakan and Nonya flavours creatively prepared by their Executive Chef Frederick Kho. The buffet choices was served alongside a spread of many Singaporean favourites such as Penang Laksa, Wanton Noodles, Homemade Crabmeat Popiah, Hainanese Chicken, Char Siew and Pork Belly Rice all at their own individual Live-station! Aside from these home-style and familiar dishes, take the feasting further with the ‘Get Hooked on Weekends’ promotion! We enjoyed unlimited servings of hot and cold seafood delights such as fresh Oysters, Tiger Prawns, Boston Lobster, Rich Lobster Bisque and Chilli / Black Pepper Crabs! Seafood lovers will sure to enjoy the dinner sessions (6-9.30pm) which is only available every Fridays and Saturdays for $SGD55++. Traditional Potong Ice-cream for dessert, why not? Breakfast can be had at either on the first level at the J65 or at the Club Lounge for guests staying in the Club Rooms. There’s a wide variety of international and Asian cuisine served and has most of the essentials of a breakfast buffet. Another cool part about the breakfast spread is that unlike other hotels, Hotel Jen encourages guests to ‘tapao’ food using their ‘Tapao Box’ provided. A local term, tapao actually means to take away or to-go. A pretty interesting initiative for guests who prefer to have their food back in their rooms, or for guests who are in a hurry. Hotel Jen is also directly connected to Tanglin Mall via a bridge located on level 2, with lots of shops, restaurants, supermarket and a foodcourt to explore. The hotel is also within walking distance of the shopping district Orchard Road and the Botanic Gardens if you prefer a somewhat serene weekend, plus you can also rent a bicycle to get around the area! Overall, staying at Hotel Jen Tanglin is a perfect getaway idea for a pampering retreat, with an extensive range of facilities and activities to soak yourself in that Jen feeling. * This was a media invite and is written in collaboration with Hotel Jen Tanglin. A foodie at heart, Xue Wei’s passion for food and travel translates to her daily snippets of her affairs on her blog and Instagram. A quality that’s reflected in features like her ‘Best Matcha-places to go’ and ‘16 Must Eat Taiwan Food’ in collection, where she hunts out the best hits in all of the places she’s been to. When she isn’t chasing her love for food and adventure, she enjoys photography, travelling, volunteering and spending quality time with her family.